(Translation) Marcelo Justo, writing for BBC Mundo, explores the reasons why Latin America still suffers from such severe levels of inequality, despite economic gains since the turn of the century. 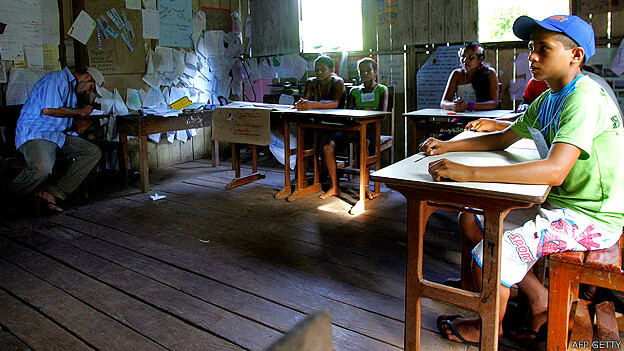 Children in a school in Acre, Brazil. The difference in access to good education is part of what perpetuates inequality in Latin America. Photo via the BBC. Despite the growth of the past decade and the application of redistributive policies, Latin America continues to be the most unequal region on the planet, beaten only by a region plagued by war and famine: Sub-Saharan Africa. The social advances are unquestionable. 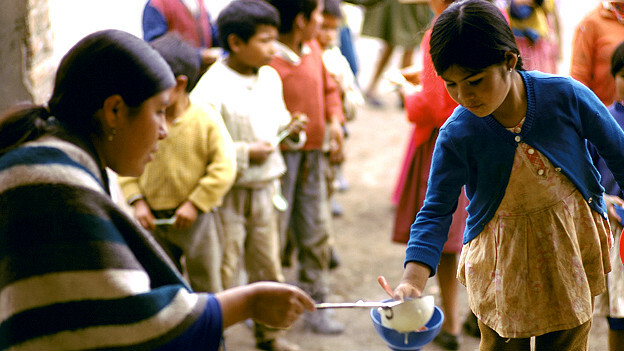 Over the last 15 years some 100 million Latin Americans have risen out of poverty. However, the distance that separates them from the richest has barely changed. Various readings of the standard international measurement of inequality, the Gini Coefficient, seem to confirm this. According to the World Bank and the Centro de Estudios Distributivos, Laborales y Sociales (CEDLAS – Centre for Distributive, Labour and Social Studies), Sub-Saharan Africa has an inequality rating of 56.5, followed by Latin America with 52.9, and relatively far ahead of Asia (44.7) and Eastern Europe and Central Asia (34.7). One of the authors of this measurement is CEDLAS’s Leonardo Gasparini, who told BBC Mundo that this inequality has deep-rooted historical origins: “Latin America has been very unequal since colonial times. Part of the current gap [between rich and poor] is down to a long history of elitist societies, with largely undemocratic political systems and exclusive economic models. The advances that have been achieved since 2000 have only served to compensate the deepening of inequality that was seen during the 1980s and 1990s, and which led to the region earning the title of most unequal region in the world”. In spite of reductions in poverty, inequality continues to be an insurmountable obstacle for millions of Latin Americans. Photo via the BBC. The Gini Coefficient analyses the distribution of income among various social sectors, with values that range from 0 (perfect equality) to 1 (complete inequality – i.e. where one person has all the wealth). It has been calculated that poverty has gone down by some 30% in Latin America since 2000, and that this fall has made some impact on inequality levels, which have gone from 0.54 in 2000 to 0.5 in 2010. Even so, compared with the most equal countries in the world this gap is still abysmal: the Gini Coefficient among the Scandinavian countries is around 0.25. According to Gasparini, the successes of the past decade have been due to a mix of factors to do with the economy and social policy. “The fall in inequality owes itself in part to outside conditions, such as the strong improvement in terms of trade (export prices versus those of imports), and in part to the policies that have been enacted, such as the increase in social spending, with focalised programmes such as conditional cash transfers (CCTs)”, Gasparini told BBC Mundo. One example of these CCTs is the Bolsa Família (Family Allowance), a monthly allowance received by a quarter of the Brazilian population, on the condition that families guarantee that their children go to school. Similar programmes exist across Latin America, with examples including Plan Familias (Family Plan) and Plan Jefes y Jefas de Hogar (Household Heads Plan) in Argentina; Bono Juancito Pinto (Juancito Pinto Voucher) and Madre Niño-Niña (Mother-Child scheme) in Bolivia; Chile Solidario (Chile Solidarity); Familias en Acción (Families in Action) in Colombia; Bono de Desarrollo Humano (Human Development scheme) in Ecuador; and Oportunidades (Opportunities) in Mexico. The impact is twofold. On the one hand household incomes are boosted, and on the other progress is made on education among society’s poorest sections, thus helping to foster greater social mobility. The elderly are one of the social sectors where the worst pockets of poverty are concentrated. Photo via the BBC. 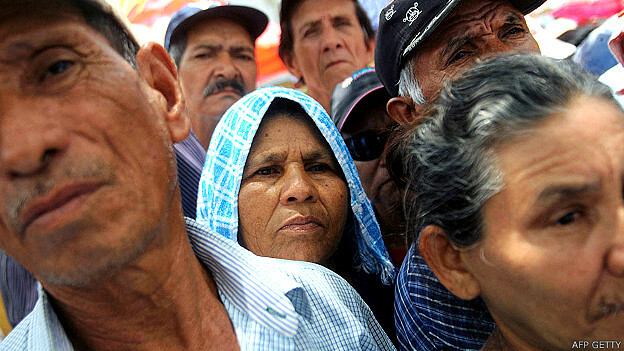 Added to these policies have been other initiatives which have helped to combat poverty, such as increases in the minimum wage across the region and the implementation of schemes specifically directed at the elderly, among whom the most lasting pockets of poverty and indigence tend to be found, particularly in countries like Argentina and Bolivia. However, as explained to BBC Mundo by Marta Lagos, director of Latinobarómetro – a polling company that carries out surveys on a regional level – these undeniable advances in poverty reduction have not had a similar impact on social mobility. 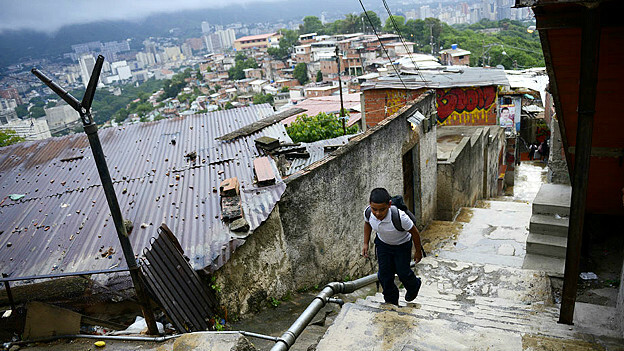 “Latin America’s poor are forever the same. We have societies that are highly stratified with very little social mobility. In fact, we could eliminate poverty entirely and we would still have just as strong inequality. In order to fight inequality people need greater access to power, education, and health”, Lagos says. In the field of political power, one potent sign of exclusion is that Latin America had to wait until 2006 before it would have its first democratically elected president from an indigenous background: the Bolivian Evo Morales. Yet in a region with more than 40m people of indigenous descent, the President of Bolivia is more an exception than the rule. This exclusion, which encourages further inequality, isn’t limited to questions of ethnicity. “There is a certain level of health and education for the rich, and an entirely different one for the poor, who have to come out and compete with a clear disadvantage”, Lagos told BBC Mundo. This inequity is both reflected and reinforced by what should be one of the solutions to this great problem: tax policy, the true Achilles Heel of Latin America. 75% of Latin Americans believe that the distribution of wealth is unfair and that there isn’t any real social mobility, according to a survey by Latinobarómetro. Photo via the BBC. Taxes can be either direct (such as on income or property) or indirect (such as on consumed goods). The first favour more equality under the principle of those having the most paying the most. However, tax on consumption – also known as valued added tax (VAT) – is exactly the opposite. Instead of having a redistributive effect, it is regressive: the rich and the poor pay the same rate of tax added to the price of a given product. A recent study on fiscal policy in Latin America, carried out by two economists from the Comisión Económica para América Latina y el Caribe (CEPAL – Economic Commission for Latin America and the Caribbean), Juan Pablo Jiménez and Andrea Podestá, underlines the imbalance of the tax burden on the rich and poor. “In Latin America, less than a third of tax revenue corresponds to direct taxes. The bulk of it falls on taxes on consumption and other indirect taxes. The tax burden is not just low, it also has a clear regressive bias”, they explain. That’s not all: the enormous tax evasion that exists in the region, fuelling capital flight, means that those who have more pay even less than they should, making the most of canny manoeuvres offered up by specialist accountants and lawyers, or tax havens. The alarming impact that this has on inequality is clear for all to see in a study specifically on Argentina, titled “Capital Flight III (2002-2012”, which found an increase in the country’s Gini Coefficient from 0.42 to 0.49 once funds stashed away in tax havens are taken into account. Given this state of affairs, it is hardly surprising that the perception among Latin Americans coincides with the nickname of “world’s most unequal region”. According to a Latinobarómetro survey, 75% of Latin Americans believe that the distribution of wealth is unfair and that there is no real social mobility. In the same survey, to the question on which social groups were those which least complied with the law, the majority of respondents put in pole position the rich (who maintain economic power) and the political class (who control governmental power). This is a translation of an article that originally appeared in BBC Mundo; the Spanish original can be found here. You can also read an original Eye On Latin America article on tax evasion and its implications for developmental policy in Latin America here. Latin America: leading the way on renewables?